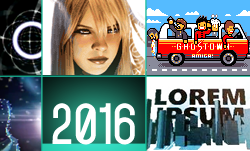 Best Amiga demos of 2016 based on Pouet top 10. Demo reviews by Slayer, JazzCat and Jok. Nice review! Sorry about spelling your group name wrong! :O I'll do some better proofreading next time. Nice report, agree that this is the highlights of 2016. I actually spelled Ephidrena wrong too in chinese. In the demo it says &#33406;&#33778;&#24503;&#33713;&#21738;&#65292; but it should have been &#33406;&#33778;&#24503;&#33713;&#23068; &#12298;- see last character!